Once there was a little boy named Jem (short for Jeremy). His father was a loving, brilliant, and eccentric scientist. During an experiment, Jem’s dad turned himself into a huge orangutan. For dad, the advantages of this change were obvious: increased physical prowess and the ability to go undercover on top-secret assignments and not be recognized as a person. Unfortunately, the people of New York City were not impressed with this transformation—Jem’s dad lost his job, was harassed by animal control, and the family was evicted from their Manhattan apartment. Jem and Dad came to the realization that they had to leave New York City. They embarked on a quixotic search for Leonardo Da Vinci, whom Dad believes lived out his last years somewhere in upstate New York. Unlikely? Sure, but, then again, Dad’s an orangutan. B. B. Wurge’s The Last Notebook of Leonardo is a fun, light read targeted at preteens and ambitious younger readers. Like most young adult books, it relies on a fantastic event to propel the plot. In this case, Wurge relies on two: the orangutan transformation of Jem’s father and the unraveling mystery of Leonardo Da Vinci’s life in northern New York (before Da Vinci relocated somewhere truly exotic). As with J. K. Rowling in the Harry Potter books, Wurge explains the fantastic with restraint, avoiding heavy sci-fi explanations. This allows Wurge to paint New York realistically. Jem and Dad trudge through snowstorms and small towns, meeting with a mix of intolerant and friendly people. The air of realism helps readers accept that a man can become an orangutan and that people can live on the moon. As part of reviewing The Last Notebook of Leonardo, the book was shared with an intrepid 10-year-old reader, Ellie. From Ellie, the reviewer learned that the book “was funny and interesting.” The illustrations at the start of the chapters were appreciated. Elle also said the book reminded her of Madeline L’Engle’s A Wrinkle in Time. She was happy the book taught her a little about Leonardo Da Vinci and orangutans. A few interesting facts aside, The Last Notebook of Leonardo is primarily for entertainment. But even in entertaining stories there are lessons. Wurge gently instructs young readers not to jump to conclusions based on appearance—the smartest person you might ever meet could turn out to be an oversized, hairy, orange primate. Probably unintentionally, The Last Notebook of Leonardo puts a modern, tolerant spin on the Frankenstein story. Frankenstein’s monster was ugly and different, but never evil—at least not until ugly overreactions from ignorant people pushed him toward homicide. In contrast, Wurge’s monster meets several fair-minded people who can see past the orange fur and 500-pound body—and only with their critical assistance can a brilliant scientist (who just happens to be a primate) unravel the secret life of Da Vinci. This reviewer does not make a habit of reading young adult books. 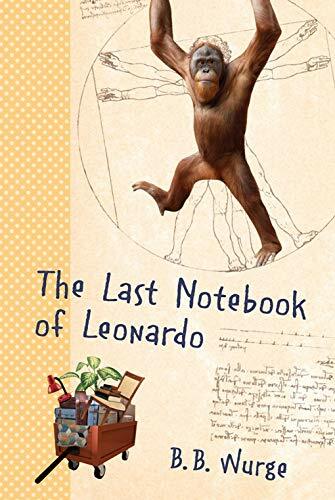 I concur with Ellie: The Last Notebook of Leonardo is a funny and interesting little book.